When is a story more than a story? I’m not suggesting a common page-turner, a thriller sweeping you away. Instead, I refer to a fine short story or novel, and its ability to reveal something more about human inner-workings than even a mass market psychology text or a self-help manual. Take Herman Melville’s 1853 short story, Bartleby the Scrivener: A Story of Wall Street. Not a title to make you think the writer knew much about the unsettling emotional complications of two psyches within a law office. He did though. A scrivener is a copiest, a scribe, such as lawyers employed in the days before off-set printing and Xerox machines took their jobs away. Legal documents had to be duplicated by hand: back-breaking, carpel tunneling, mind-numbing work. Long hours bent over an unsuitable desk made it worse. Your profession was known by the permanent ink stains on your hands and clothing. The unnamed attorney who narrates the story tells of a quiet, strange employee. He gives us his first impression of the man: “I can see the figure now — pallidly neat, pitiably respectful, incurably forlorn! It was Bartleby! More and more such responses challenge both the lawyer and Bartleby’s three co-workers. The stand taken is never explained. Eventually the employer even discovers the fellow living in the firm’s offices after hours: not to do anything amiss, but to pass his solitary time. And he “prefers not to” do otherwise. Our narrator tries many means to impress Bartleby with the necessity of compliance. The lawyer, however, is a Christian man in the best sense, and feels a human connection to the odd creature, thus stopping him from calling the police for his removal from the building. What have we here? Is this a tale about mental illness, social isolation, or a passive-aggressive soul’s ability to control a situation by saying no? Is it an indictment of the oppressive conditions of long days spent in work that requires attention to detail achieved through concentration on a mindless, repetitive task? Is Melville making an indirect social comment on entitlement, such as Mr. B’s presumption in turning a job into a work-free, free-ride to salary and a residence? Does he mean us to recognize the title character’s employer as a charitable man or one with too weak a will, thus becoming hostage to an employee who does nothing? Could the novel be trying to point out the absence of a satisfying place for many of the residents of a capitalist-dominated world that is too concerned, as Wordsworth told us, with “getting and spending?” One more possibility: might the author wish us to consider why two men very differently situated in the pecking order of professional life would continue to behave as they have rather than change, no matter the consequences? The reader is put into the role of psychologist, trying to understand Mr. B. and the attorney. Both are extremes and we learn from extremes perhaps more than those examples of life in the middle of things. The underling is stubborn without limit, the individual “on top” displays limitless charity. Does Bartleby offer us an everyday example of a person so mistreated in the past that he can no longer differentiate a man offering a helping hand from one whose hand is prepared to strike him? If so, those of us who engage in creating our own slow motion, step-by-step tragedy should take note. I could as easily call Mr. B. a depressed and self-destructive man, acting in such a way as can only end in his misfortune. Melville’s 36 paperback-pages can be read many ways to be sure. It is laugh-old-loud funny, on occasion, as well. And if you find yourself siding with Bartleby or his employer, you might ask yourself why one and not the other? Regardless, try not to judge these two men harshly. Like the remaining three wage slaves in this law office and a few we meet along the way, they are just trying to make the best of the hand dealt them by nature, their upbringing, and the world of other men and women. Have you ever been called a narcissist? What does that mean? Let me offer you an image that might help you understand it. Imagine that you are standing in front of a mirror, but at some distance from it. You can see yourself, but you can also see a great many other things around and behind you. Now envision yourself walking toward the mirror. If you get close enough, you will see only one thing: yourself. It is not necessarily that you are indifferent to whatever else might be behind and around you; rather, you are so taken with your own likeness, that you become unaware of other people nearby and how they might be faring. That is narcissism: a fascination with and almost exclusive focus on yourself. 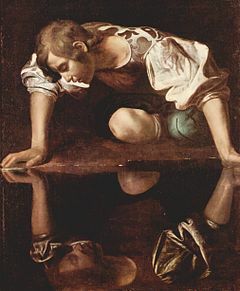 The word comes from the Greek myth about an unusually attractive young man named Narcissus, who falls in love with his reflection in a pool, not aware that he is looking at his own image. Inevitably he perishes because he cannot get over this preoccupation. At the extreme, too much narcissism becomes a Personality Disorder. That means it is a pattern of behavior and internal self-involvement that is rigidly pervasive and leads to problems in relating to others. People who suffer from Narcissistic Personality Disorder tend to lack empathy for others; they are grandiose in their inclination to overestimate their worth. They usually assume that others will not only share in this high appraisal of their value, but treat them accordingly. Indeed, they expect to be admired and take that admiration as an entitlement. The word insufferable comes to mind. Such people believe that the rules that apply to most others might not apply to them because of their special qualities. Nor do they clearly see the injuries that they inflict on others; or show empathy even when such injuries are brought to their attention. If you are useful to a narcissist, able to help him advance his agenda, then he will probably want you around. At the moment that you are no longer of value, however, or have been replaced by someone deemed better or more useful, you are in danger of being set aside or discarded. The narcissist tends to have fantasies of great achievement or idealized love and exploits others. And when his behavior fails to lead to the result that he believes is his due, it is rare for him to fully recognize and take responsibility for that failure. Without that awareness, circumstances and other people are blamed, and he is likely to continue on the same unfortunate path indefinitely. And to answer the question posed in the title, given the blind spot just mentioned, if you are narcissistic, it is unlikely that you will so identify yourself. Initially, you might find such a person dashing, enormously self-confident, and appealing, perhaps even a visionary — definitely a big personality. Closer and more frequent contact, however, begins to reveal the dark side. Loving someone else is difficult for the narcissist, who is already in love with himself. At least as he has been represented in the press, the Governor of South Carolina will serve that purpose. Obviously, one cannot diagnose him or anyone else on the basis of news accounts, but they suggest that he might fill the bill. He is said to be taken with himself, preoccupied with his achievement and appearance, and fancies himself (and his South American lover) as sharing some sort of idealized, almost mythic love. Meanwhile, in the course of his affair, the wife and kiddies back in the States were set aside; even his responsibilities to his constituents were ignored, as he took secret trips to visit his girlfriend, leaving South Carolina without anyone in charge while he was away. I suspect that you know some people who are pretty full of themselves and might have some of the other characteristics I’ve mentioned. Personality Disorders of this kind are not easily altered. Indeed, such people rarely see the need for treatment — their reflection in the mirror looks more than good enough to them. Self-awareness is not one of the narcissist’s strengths. No, change won’t come easily. A better question to ask yourself would be the following: why would you WANT to be with him? 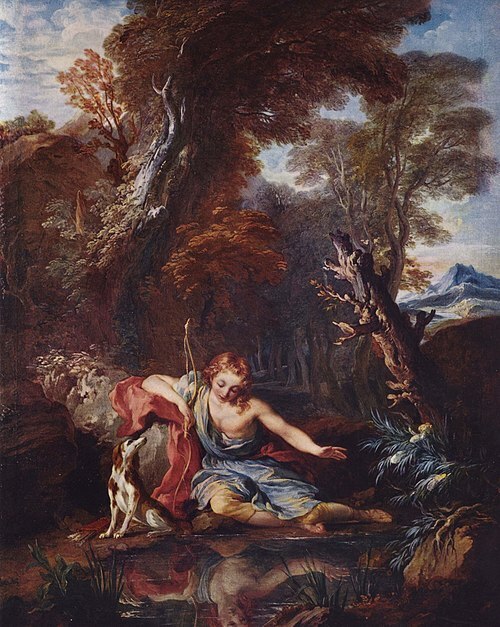 The painting at the top of this essay is Narcissus by Francois Lemoyne, from 1728, sourced from Wikimedia Commons. The second image is Caravaggio’s take on the same subject (1594-1596), from the same source. What price would you be willing to pay to feel that you are special? I will tell you a story of one young woman who has paid that price and then some. She is an example of how we sometimes defend our self-image at the cost of our happiness. The patient of another psychologist, I knew this woman for about 20 years, filling-in for her therapist when he was on vacation. Gloria (not her real name) had a tragic early life. She was victimized by her parents’ verbal and physical abuse and neglect, and became an easy target for schoolmates. Gloria was unlucky, too, in that she was born with slightly less than average intelligence. Making things even worse, her body was naturally graceless and her facial features were less than attractive. But, Gloria could be sweet and socially engaging, willing and able to approach strangers and make conversation despite a long history of rejection. Even with all her disadvantages and misfortunes, Gloria, now a middle-aged woman, might still be able to have a good and pleasing social life except for one thing: she believes that she is the world’s unluckiest person, the record-setter for having received the greatest misfortune in the history of the planet. Moreover, she feels compelled to report her tale of woe to those people she begins to get to know, very early in her relationship to them. This has the predictable result — they shy away from her, leaving her feeling rejected once more, and adding to her claim that she has been the most ill-treated human in recorded history. I am not being facetious here; I once asked her to compare herself to various victims of misfortune including those who had been tortured, suffered in natural disasters, lived in concentration camps, or been plagued with disfiguring and painful illnesses. She assured me that her lot in life was far worse than any of them; and, that it was only fair and reasonable to expect people to be sympathetic to her and give her some of the understanding, sympathy, and support she had always been lacking. Thus, Gloria pursues with a vengeance the comfort and affection that she believes she has coming to her. Her sense of entitlement to this, her insistence that her fellow-man should and must provide this, drives people away from her in her striving for the love she has never had. Of course, her therapist points out to her the self-defeating nature of this strategy, the need first to establish relationships based on something other than the other person’s willingness to listen to her sadness and anger. Gloria doesn’t accept this, unfortunately. The world and the rest of the human race owe her this hearing (so it seems to her), the sooner the better, and it is only fair and just to expect them to deliver what she wants. Gloria is smart enough to understand that people she hardly knows might not have much patience or interest in accepting her premature self-disclosure. And so, you might well ask, why does she continue to do the same thing over and over with the same bad result? Why doesn’t she try something different? After much consideration of that question, here is the best answer I can provide. First, Gloria is so desperate and needy, so starved for affection, that it is difficult for her to restrain herself from lunging at the thing she desires whenever she first sights it. But, more importantly, I think the one thing that Gloria values above everything in her life is her self-appointed status as The Most Unfortunate Person in World History. Now, you might say that you wouldn’t want to hold that particular title. But, think about it. I suspect that this designation gives Gloria the only form of distinction she could every expect to achieve in life. Without it, she is simply a sad, angry, lonely, unattractive, unaccomplished, anonymous person; but with it, she is something special, someone who stands out from the crowd, a noteworthy individual, one in six billion, the leader in her class. And the self-nourishment she receives from licking the wounds attendant to this awful position in life almost certainly provides her with some amount of solace. I’m sure Gloria would deny the psychological explanation I’ve just provided for her self-defeating behavior and I cannot promise you that it is accurate. But I would ask you this. Do you know people who persist in self-defeating behavior despite all the advice, therapy, or wise counsel offered by friends, relatives, and therapists? Have you sometimes wondered why they do so? Often the answer isn’t “logical” in that it doesn’t “make sense” intellectually. But, it just might make sense emotionally, as I believe it does for Gloria. If, somewhere deep inside, she doesn’t really believe that she can achieve the life she wants, her behavior suggests that she has found a method, however self-defeating it is, to give herself some of the sense of status and recognition that life hasn’t and probably won’t provide to her. Gloria was dealt a bad hand in life. Her response to that deal of the cards is instructive. She seems to have chosen a sort of fantasy, a story about herself that compensates her for her misfortune, just as it simultaneously fuels her continued loneliness. But be careful should you wish to dismiss her behavior as “crazy” too quickly. We all do self-defeating things in life. Before you condemn her, check yourself out in the mirror. The drawing above is called Africa Lonely Kids by Myfacebook. It is sourced from Wikimedia Commons.